What springs to mind when you think about garden shed interiors? A wooden unit filled with your garden equipment? A room to store all the clutter that has no place in the home? A safe place to use power tools and conduct DIY projects? If yes, well that’s absolutely fine. But why not think outside the box (shed)? A shed doesn’t have to be limited to storage – there is great potential to extend your living space and transform your garden shed into a wonderful summer house, a wooden workshop for DIY projects, a games room, or even an outdoor retreat. Below, we have chosen some of our favourite garden shed interiors. Browse our top 5 and gain some inspiration! And, if you see anything you like, get in touch with Sheds To Last – speak to our friendly, professional team to discuss how we can make for garden shed dreams a reality. Turn that ordinary shed into a tranquil space for you and your loved ones to escape. Install a couple of chairs or sofas, some furniture, carpets, curtains, scented candles and a decent audio/visual set up and voila, you have yourself a neat little couples retreat. Use calming greens and pastel colours to create a neutral environment, or reds and blacks for something a little more passionate! Catch up with your significant other in the comfort of this creative outdoor escape. The sun is out – what better way to celebrate than by setting up your very own summer house in the garden? 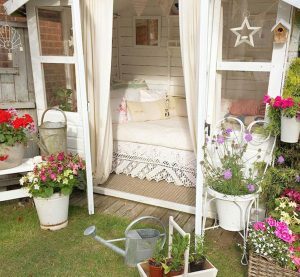 Create a breezy living space in your garden shed and enjoy the glorious weather. To create a rustic look, use white furnishings against wooden walls and floors. Add in a table and chairs and you have the perfect space for hosting guests during a summer BBQ, or for having an intimate dinner date in warm summer evenings. Throwing a garden party? Want somewhere to take your friends and family for a drink in peace and quiet? Repurpose that forgotten storage space today and create your very own shed bar. There is absolutely no reason why you can’t! 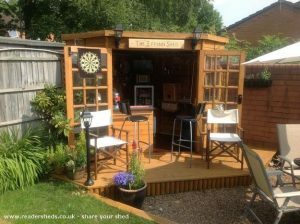 Whether you are aiming to kit your shed bar out with all the amenities of a sports bar, set up a refined cocktail lounge or you want to create Carribean ‘rum shack’ in your back garden, there’s plenty of shed bar designs to choose from. If you are looking for some inspiration, there are hundreds of Pinterest images to browse. For many, a garden shed offers a home away from home. So why not decorate it exactly the way you want? The ‘man cave’ has long been seen as a place to have inspiring and creative thoughts, to conduct autonomous projects. If you’ve been having cravings for a man shed to call your own you may want to get in touch with Sheds To Last for a chat about how we can help! This shed’s interior is perfect for the sporting man. Throw in a pool table or foosball table, maybe a TV and some sofas, and get ready to hang out with your mates in the comfort of your own premises. The she shed trend is here to stay! And we are loving some of the classic designs that are around at the moment. More and more women are setting up sheds in their back garden as a spot to call their own. Whether you are looking for a space to curl up and read a book, somewhere to entertain guests in the garden or a creative space/studio to work, there is myriad she sheds out there to inspire you. 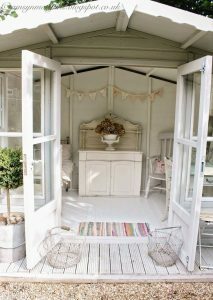 Whether you are interested in creating a shabby-chic beach hut, a cosy cottage feel or a Moroccan riad-style shed, Sheds To Last can help to create the finest she shed out there. 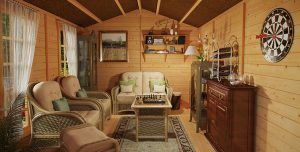 At Sheds To Last, we supply garden sheds, wooden workshops and summer houses to suit your every desire. 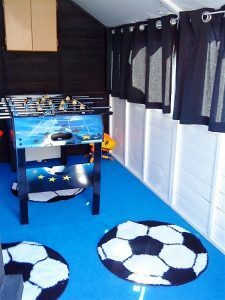 Contact us today to find out how we can help you spruce up your garden shed interiors.